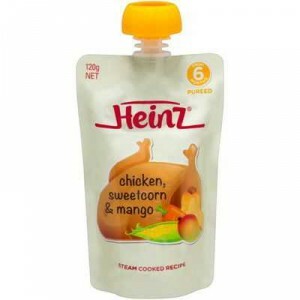 My little one loves this heinz chicken, sweetcorn and mango baby food. It comes in a convenient pouch, which is great for on the go. My little one gets the nutrition she needs from this pouch. Heinz 6 Months+ Chicken, Sweetcorn And Mango is a great meal for your Bub . My son loved it . The combination of chicken , sweet corn and mango just unbelievable. A tasty one! And no nasties.. This was my kids favourite meat squeeze pack. They were both more a fan of fruit ones however I wanted them to try meat but found it hard to make it smooth myself. This product was a lifesaver and I brought heaps of these packets until the my babies were ready for small ‘bits’. My daughter normally screws up nose to anything that has meat in it but i tried this tonight and she couldn’t get enough. Will be buying again. My bub loves the taste and would eat more if I give it to him again and again. Great taste love the product so much. How would you rate Heinz 6 Months+ Chicken, Sweetcorn And Mango?